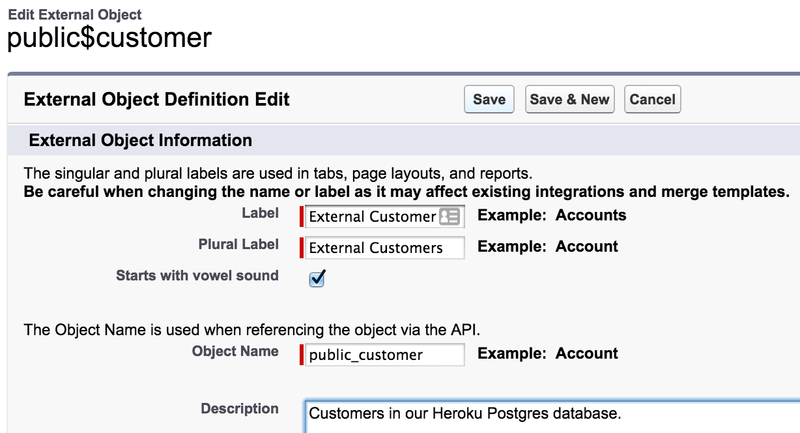 This guide shows how to use Heroku External Objects and Salesforce Connect to integrate data from a Heroku Postgres database into Salesforce. All of this is done by reference: the data remains in Heroku Postgres, but it can be read from and, in most cases, written to from within Salesforce. 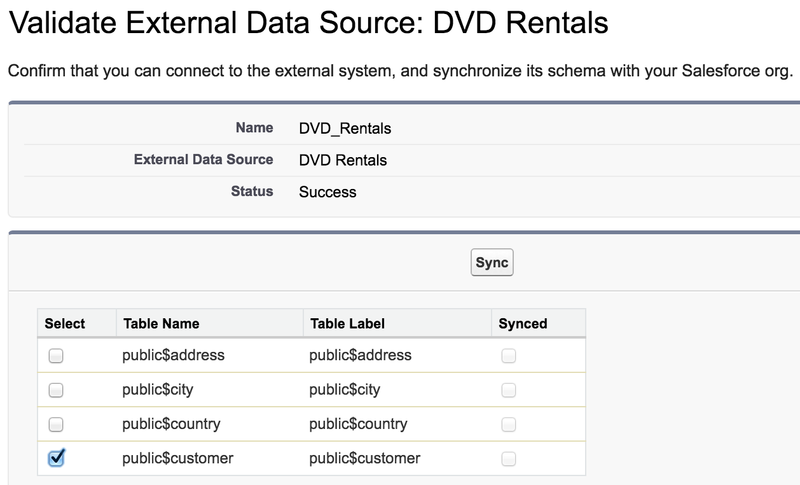 The PostgreSQL data that we’ll use is from a sample DVD rental database. See the Appendix section for instructions on how to import the data into a Heroku Postgres database. Salesforce Connect is a separate product from Heroku Connect. If you don’t already have Salesforce Connect, please contact Salesforce for licensing information. As a prerequisite, you need to provision the Heroku Connect add-on. Using Heroku Connect to sync data with Salesforce is optional: if you’re only interested in Heroku External Objects, you can skip the step that asks you to authorize your connection with Salesforce. If it’s your first time using Heroku External Objects, you’ll be prompted to create the OData service’s login credentials. Once you’ve completed this step, you can view and manage the login credentials at any time from the dashboard. To complete the setup, you need to choose the tables and/or views to expose. All schema within your Heroku Postgres database will be available, including those schema not actively managed by Heroku Connect. Unlike tables, views do not currently support writes. Additionally, Connect requires that each view contain a uniquely valued column named ‘id’. Be sure to select “Writable External Objects” if you’d like to use the read/write capabilities of OData 4.0. Since we use a single password, you need to choose “Named Principal” as the Identity Type and “Password Authentication” as the Authentication Protocol. Your username and password are available from the Heroku External Objects dashboard. After saving your External Data Source, click on “Validate and Sync” to check the connection and synchronize its schema. Each table you select will be an External Object. Initially their names will have $ characters instead of periods, but you can edit the labels. We’ll call ours “External Customer”. Like any other object, you can create custom object tabs and customize layouts for External Objects. We can also make SOQL queries against our external object, which has the API name public_customer__x. And since we enabled writes, any create/update/delete operations are written to the Heroku Postgres database. 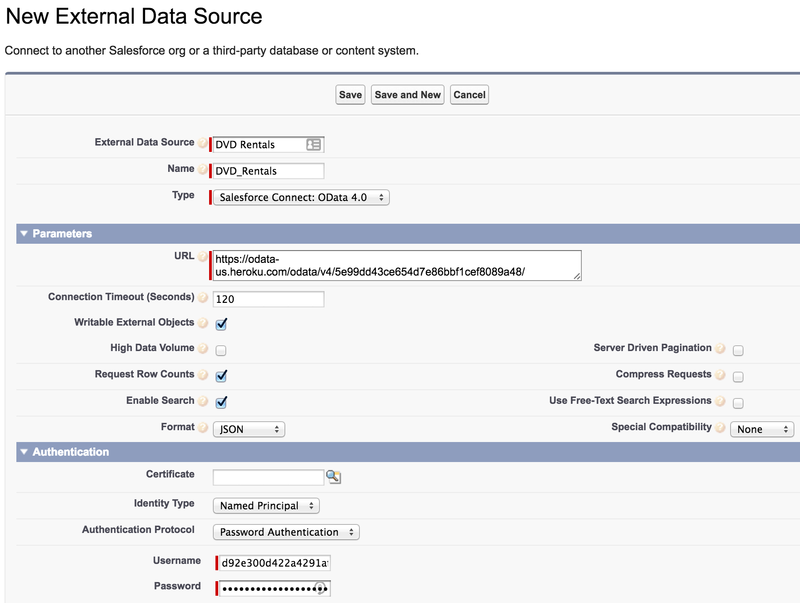 We can also use external IDs to associate records in Salesforce with their corresponding records in Postgres. 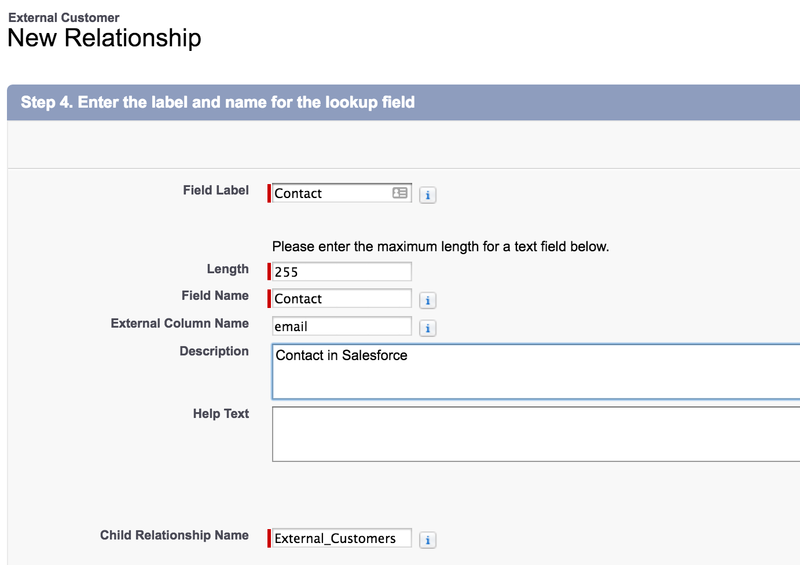 Let’s create an external ID field on Salesforce contact objects, which will link the records using the customer’s email address. On the next screens, relate it to the Contact object (Step 2) and choose the external ID field (Step 3). In Step 4, be sure to specify email as the external column name. 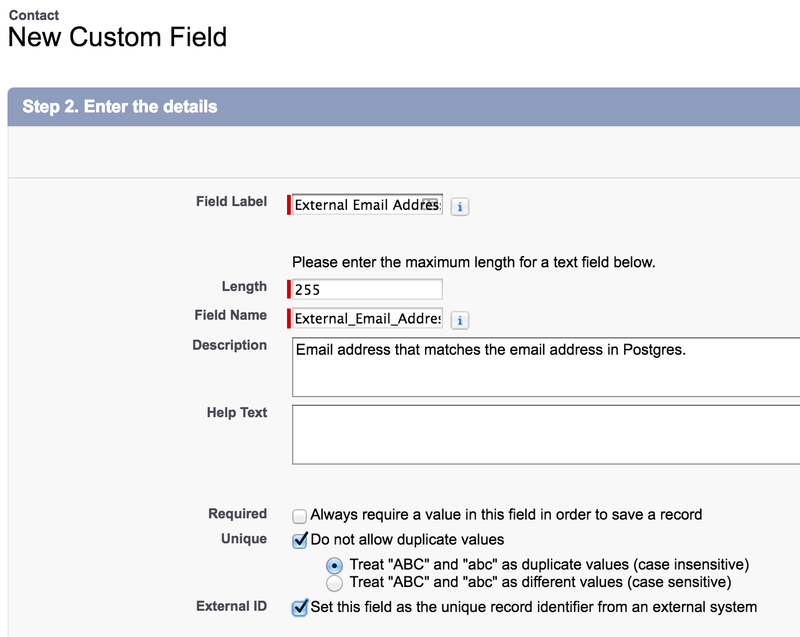 We’re done – contacts in Salesforce with External Email Address fields will be related to their External Customer records. Clicking on the email address link on this External Customer record will take us to Mary’s contact record in Salesforce. Mary’s contact record also has a related list that links back to the external object. It’s not possible to import the dvdrental.tar file directly to Heroku Postgres because it’s not in the format the Heroku Postgres requires.